HIS LIFE STORY remains well known, in large part because he told it himself, in the first great modern autobiography, The Confessions. Born the son of a poor Swiss watchmaker, he had little formal education, and, according to some biographers, may have suffered from dyslexia. Running away from home as a teenager, he spent years on the margins of society, taken in for a time by Françoise-Louise de Warens, thirteen years his senior (“Mama”). He dreamed of a career in music, and invented an unwieldy system of musical notation, peddling it so fervently that despite his considerable personal charm, many dismissed him as a crank. It was through music, though, that he made friends with some of the most important of the Parisian philosophes, the guiding spirits of what we now call the Enlightenment. Finally, in 1749, he got his big break, when he won an essay contest sponsored by the learned Academy of Dijon, on the question of whether the restoration of the arts and sciences had improved moral behavior. Daringly, he answered the question in the negative, and overwhelmed the judges with his eloquence. Over the next three decades he wrote a stream of major works. But he refused to pay court to wealthy, noble patrons, as most other writers of the day did, and lived in ostentatiously humble circumstances with an uneducated seamstress, the mother of his abandoned children. In the early 1760’s, his unorthodox religious views led both France and Geneva to ban his books, and to force him into flight and exile. In his later years, his behavior turned increasingly erratic, even clinically paranoid. “The ceilings above me have eyes, the walls which surround me have ears,” he wrote in the second installment of the Confessions.He denounced former friends for conspiring to destroy him, and, having finally returned to France, died there in 1778. Yes, such language could inspire a disastrously exaggerated faith in the redemptive power of politics. But it could equally inspire a just, humane, and progressive politics in a world that sorely needed it. Rousseau’s political thought was remarkable enough, but it formed only a part of a much broader set of reflections on the human condition. In his 1754 Second Discourse he offered nothing less than a conjectural deep history of the human species, tracing how competition, jealousy, exploitation and suffering had arisen hand-in-hand with civilization. Brutally mocked at the time for its portrayal of humans in an animalistic “state of nature”—one satirical stage play depicted the author snuffling across the boards on all fours—it has stimulated anthropological thought ever since. Rousseau’s 1762 Emile, meanwhile, offered a detailed program for educating healthy, moral young men (and, very secondarily, young women). The book met with enormous success, which generation after generation of early childhood gurus have striven to imitate. According to some observers (including Pamela Druckerman in the recent Bringing Up Bébé), French parents still swear by Rousseau above all else. Emile highlighted Rousseau’s concern with another feature of the human condition: individual psychology, and how it is molded by childhood experience. At the time, few people in the Western world saw childhood shaping the mature individual in the way we today take for granted. Children were more often perceived as imperfect adults. Rousseau insisted that personality developed organically, with early experiences profoundly determining later life. And in The Confessions he demonstrated the point through an examination of his own idiosyncratic life story. He called this work, with some justice, “an enterprise without precedent […] Let the trumpet of Judgment Day sound when it wishes. I will appear before the sovereign judge with this book in my hand.” In one famous passage, he recounted an early spanking he had received, and commented: “Who would believe that this boyhood punishment, received by a child of eight from a woman of thirty, determined my tastes, my desires, and my passions for the rest of my life?” While The Confessions played fast and loose with some aspects of Rousseau’s life, the frank revelations of discreditable episodes (including the abandonment of his children), and the emphasis on his most intimate feelings, and psychological development, made the book a model for subsequent autobiographies. Rousseau’s concern with personal authenticity also led him to embrace a radically new vision of what it meant to be an author. Most of his fellow philosophes published their books anonymously. They treated attribution of authorship as a game, and saw no necessary connection between an author’s personality and writings. Rousseau, by contrast, insisted that his name appear in full on every title page, and presented his writing as a direct emanation of his own unique psyche. If we today find this a commonplace way of approaching literature, it is due in large part to Rousseau himself. Readers, meanwhile, responded to the innovation with an innovation of their own, treating Rousseau as their own intimate friend, especially after the publication of his massively-successful epistolary novel Julie in 1761. They sent him thousands of letters, expressing their gratitude and describing their own depth of feeling. “Never have I wept such delicious tears,” one of them told him. “The reading created such a powerful effect on me that I believe I would gladly have died during that supreme moment.” Others called him “friend Jean-Jacques,” and promised to live strictly according to the precepts he set down. He had become the first celebrity intellectual. Rousseau himself, however, found this form of fame oppressive. He could not appreciate the irony that the public had effectively invented an inauthentic, commodified version of the century’s great apostle of authenticity. The stress that resulted lubricated his long slide into madness. This story points to one of the real weaknesses in Rousseau’s thought and work. In a century where cold rationalism generally came leavened with irony and wit, he was almost entirely humorless, and tremendously moralistic. These qualities could serve him well when posing as the prophetic scourge of a corrupt modernity. They did not detract from his eloquent rhapsodies about the glories of nature (the Romantic manner of communing with nature owed much to Rousseau), or from the advocacy of a purified, “natural” religion that had only a distant relation to Christianity. But they made Julie something that readers today generally find unreadable: hundreds and hundreds of pages of unadulterated, indigestibly virtuous sentiment. And they rendered his judgments of his myriad enemies—including ex-friends like Denis Diderot and David Hume—chilling, harsh, and merciless. Arguably, these qualities, more than any of the overt political prescriptions, constitute Rousseau’s most truly harmful legacy. On the one hand, they left a deep impression on generations of revolutionaries in France and elsewhere, steeling them to purge opponents without pity in the name of creating stern Republics of Virtue. 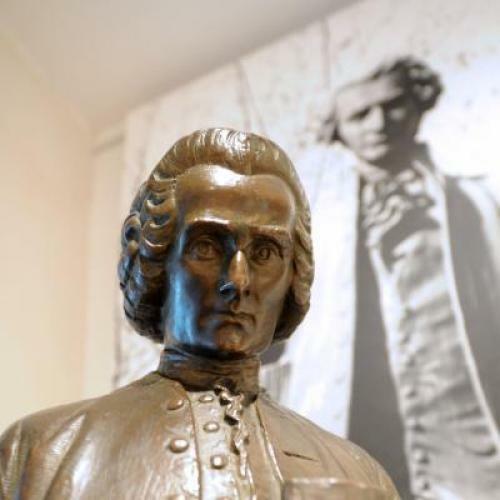 Maximilien Robespierre, himself an exceptionally humorless man, felt a deep personal bond with Rousseau. And they also shaped Rousseau’s unfortunately influential attitudes towards women. While his writings on the subject were more nuanced and complex than an early generation of feminist scholars gave him credit for, he was hardly a man to savor the game of seduction, or to engage in battles of wits with elegant ladies in aristocratic drawing rooms. He saw the two sexes as fundamentally, physically opposed, and believed that undue mixing between them would corrupt and adulterate both. “There are no good morals for women outside of withdrawn and domestic life,” he concluded. “The peaceful care of the family and the home are their lot.” He would have been utterly horrified by the irony that the rhetoric of liberation he did so much to invent (“Man is born free, and is everywhere in chains”) would inspire later generations of women to demand equality with men. But there is at least one modern irony that Rousseau might well have appreciated. He loathed cosmopolitanism, and believed in the deliberate cultivation of national identity. In one of his lesser political works, he lamented the fact that “today, no matter what people may say, there are no longer any Frenchmen, Germans, Spaniards, or even Englishmen; there are only Europeans. All have the same tastes, the same passions, the same manners […] all talk of the public welfare, and think only of themselves.” It would doubtless strike him as appropriate that in the month that marks the three-hundredth anniversary of his birth, we are seeing see the crisis, and quite possibly the collapse, of the boldest experiment in European integration ever undertaken.